Project executives throughout the world will nail down every penny, peso or brass razoo from a project budget, they will dismiss project managers who are a day overdue on their project, but up until now they’ve paid little attention at all to benefits. Now the world seems to be waking slowly to the realization that the successful corporations in the world are the ones that derive the benefits from their investments. Governments have realized that there are massive savings to be made from doing a project once and doing it right. However, to be blunt, the thinking on benefits management in some circles remains a little primitive. Much of the thinking is about measurement, and while that may give everyone a nice warm feeling, it’s only an illusive sense of comfort. Yes, certainly measuring benefits at the end of a project sounds like an attractive idea. However, this is hardly a panacea given that in most cases the benefits of a project will not be realized (or will not fail) until most of the guilty parties have long collected their bonuses, taken their promotions and moved on to their next gigs. The idea of measuring benefits throughout the project is usually impracticable. If it can be done then that fact often indicates either the benefits or the project aren’t well enough defined. This is because, logically, it is uncommon for a project to keep delivering after all its benefits are achieved. Perhaps a small number of projects achieve one quantum leap and then spend some time solidifying that change, but most should set the scene for longer term, deeper seated benefits. To maintain the project after delivery of benefits at best suggests a risk of "Never Ending Project Syndrome." Careful, agreed definition of the benefits. Planning for how the benefits will be delivered. Structured, deliberate management of the benefits. Preparedness to stop or re-direct the project if the probability of benefits being delivered changes. A strong contract with the change leaders who will be charged with turning the change into beneficial change. Good and typically iterative measurement at and after the end of the project. An effective mechanism for capturing the lessons from previous delivery. A genuine appetite amongst the stakeholder executives for decisions that may cost more or take longer to deliver the right outcomes! Benefits Profile – to define the benefit, its measures and mechanisms that will be employed to ensure its delivery. Benefits Contract – to clearly assign accountability for the delivery of the benefit. This is typically not an accountability held by the project manager. Benefits Database – to keep track of the benefits, the mechanisms, measures and accountabilities and also to record outcomes of our attempts at delivering benefits. I’ll explain the latter two in more detail in a later article (promise) but let’s first focus on the benefits profile as this is the absolute hub of benefits management. 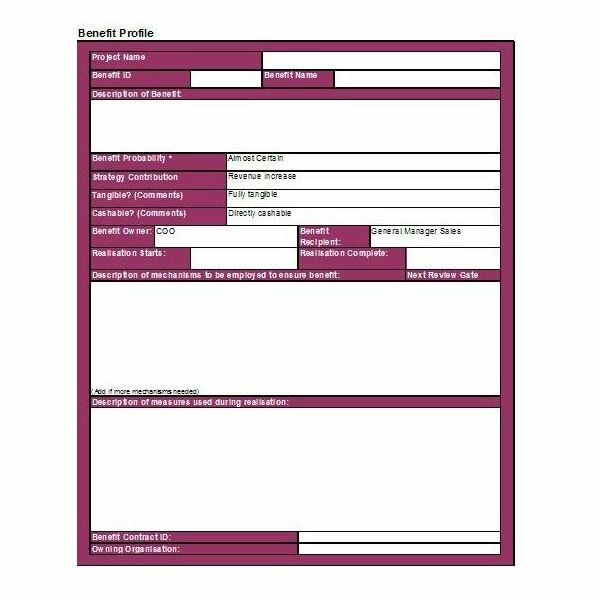 First, you may want to download the free Benefit Profile Template available in the media gallery. Benefit ID: Benefits should have unique identifiers within the organization. Typically a project acronym and a two digit serial number work well to define the benefit uniquely. Say, PSP-03 for the third benefit of the Personnel System Project for example. Benefit Name: It helps to have a short name for the benefit. This is what I call an "elevator benefit descriptor" – for the two or three words you use to explain your project when cornered by the Chief Financial Officer in the elevator, something like … “um … ‘reduced maintenance costs’"! Benefit description: This should be precise and specific, and is your chance to explain what exactly the benefit is (and what it isn’t). You may also show what characteristics deliver that benefit. For example, "reduced cost of callouts to technicians from unscheduled maintenance will be driven by a more reliable hardware base." Benefit probability: Not all benefits will be absolutely certain. For example, in a marketing project there is no guarantee that sales will actually increase as a result of new messaging. This is your chance to temper the expectations of executives. Additionally let’s remember that the probability of some benefits will change as the project progresses. Strategy Contribution: All successful organizations will have some form of strategic direction. The components of the strategy, and how well they’re spelled out, will vary from organization to organization. I’ve included a few examples in the drop down box. You can edit these by editing the list contents that start at cell N22 and the data validation list for the entry cell. Tangible and Cashable: A tangible benefit is one that can be clearly observed and is directly relevant and measurable for the receiving organization. "Cashable" goes one step further and asks whether we can expect to see an actual dollar impact from this that is either bankable or will directly and measurably reduce costs. Benefit Owner and Benefit Recipient: The benefit owner is the person who is accountable for implementing the changes in the receiving organization so that the benefit can be delivered. The benefit recipient is the person who most stands to gain from the benefit. These are sometimes the same person, but sometimes they are not. Realization Start and Finish Dates: It is important to set these dates so that we can know when we should be measuring benefits. Mechanisms: These, in my opinion, are the absolute core of successful benefits management. This section asks the question, "So, what are you going to do about making sure we get the benefits?" The mechanisms should be fairly high level tools and approaches that will be used to try to make sure we get the desired outcome. Restricting tender responses to proven enterprise systems. Ensuring respondents provide theoretical calculations of speeds on our server environment. Requiring a structured design process that covers server interactions and processing speed. Stress testing the base, out-of-the-box system before build. Requiring all system customization to be tested on a simulated live environment. Typically you should try to keep this to the top five or six things you want to do. You also need to make sure that there is agreement to each of the mechanisms, because your next step is to nominate the review points for those mechanisms. For example, the restriction of tender responses needs to be checked at a project gate before the request for tender (RFT) is released. Enforcing these gate checks is the most controversial and difficult part of benefits management. You will be seen as "getting in the way," particularly if you haven’t already agreed to the mechanisms at the highest levels. However, the results of this rigor can be staggering. A few years ago, I worked with an $A2 billion (US$2.1 billion) project that reluctantly paused a few weeks to correct some matters we identified with this technique. Later it turned out that the matters we had spelled out in the RFT were not delivered and a $200 million argument erupted. Because we could refer back to the original RFT on the matter, that was $200 million saved for the client. Applying the rigor turned out to be a win-win for both my client and their supplier. The project was an outstanding success, and because of its success has since been deliberately expanded to become an $8 billion project. That is why we do these things – so the message doesn’t get lost or watered down and the customers receive their benefits. As you can see, there is work in managing benefits that will sometimes mean making hard calls, even cancelling projects. I’m not going to paint it as three easy steps; it’s actually hard work. However, follow these steps and you will have a much greater chance of receiving the benefits you set out to achieve. Follow these steps and you'll waste a lot less money! If you're looking for more sample forms and downloadable templates, check out Bright Hub's resource guide Over 50 Free Project Management Templates and Sample Forms. All information based on author's personal experience.